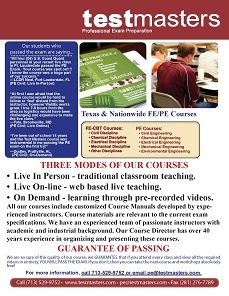 Enroll in the Testmasters FE-CBT Civil Online Course for only $999! We guarantee that you will pass the FE-CBT Civil exam. If you attend every class, do the necessary assignments, and don’t pass, you can repeat the next online course absolutely free.